Bathinda : Punjab Chief Minister Parkash Singh Badal said the government would soon start a new scheme to provide healthcare diagnostic services to the people at their doorsteps. The sole aim of the government is to ensure proper health check up of the people, he said, adding, initially the scheme would cover tests of life-style diseases like diabetes and blood pressure. The state government would soon finalise the scheme, Badal said while inaugurating the state-of-the art Advanced Cancer Institute here. Union Food Processing Minister Harsimrat Kaur Badal was also present on the occasion. The CM said this project has been completed in its stipulated time frame at a cost of Rs 400 crore. 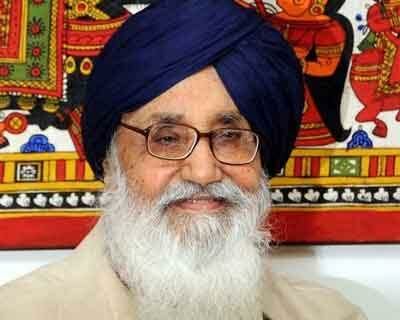 Badal envisioned the institute to be a hub of quality cancer treatment on par with the Tata Memorial Hospital, Mumbai. He said the state government has made concerted efforts to provide quality cancer treatment facilities at Amritsar, Patiala, Faridkot, Sangrur and other districts of the state. The state government has disbursed Rs 401 crore to around 32,000 patients for the treatment at the empanelled cancer hospitals under Chief Minister’s cancer relief fund, Badal said. He said that for the first time a health insurance of Rs 50,000 has been started for the people and very soon around 2000 medical stores would be opened across the state for providing free medicines to chronic patients. Later on sidelines of function, the Chief Minister said that the announcement of Aam Aadmi Party (AAP) to equate election manifesto with scriptures has “deeply bruised” the psyche of every countryman. Badal said that the apology being offered by AAP leaders on this issue was of no use as it could not undo the damage done by them.